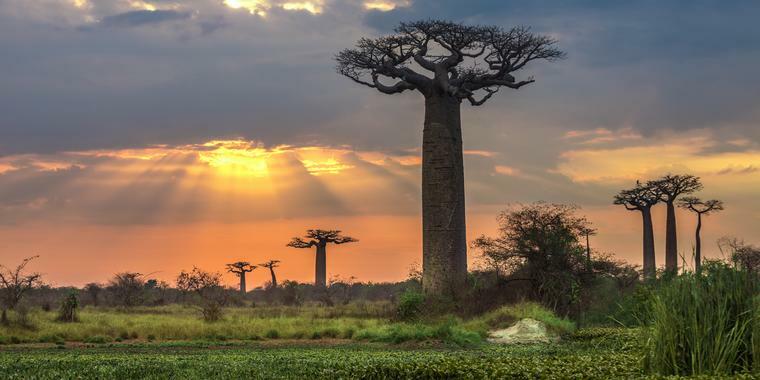 This indicates that Madagascar is the country in which baobab trees first originated, and the other two species migrated across the ocean and followed a different evolution chain in Africa and Australia. 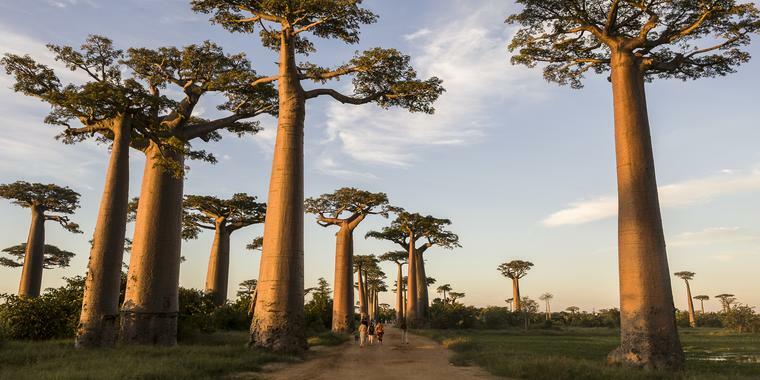 The best place to see one of these species, the Adansonia granddieri, is the Avenue des Baobabs. This is a large region with the majestic tree in abundance, and a sacred baobab with offerings around it showing the significance of the trees. There are also two that have become intertwined, and are known as Les Baobabs Amoureux. If you arrive at sunrise or sunset, the view is striking, and good photos are a guarantee. The nearest town to the Avenue of the Baobabs is Morondava. The area was the centre of the Sakalava kingdom, and the tombs here are spectacular and beautiful. It is now the centre of a rice-growing and ostrich-farming area, and is popular as a seaside resort with a laidback and friendly atmosphere. There are lots of good places to eat and the sea provides entertainment by way of swimming, snorkelling and diving. Other places to visit include the zebu marchet, which is held in the first village outside of Morondova, Analeiva. There are also some spectacular tombs, but the people are quite secretive about their locations due to vandalism of the drawings and carvings on them. To the north of the town there are dry deciduous forests which have a biological importance found barely anywhere else. This forest type is one of the most endangered in the world, and the flora and fauna includes many endemic species. Particularly numerous are reptiles such as tortoises, snakes and lizards. Eight species of lemur are found including white sifaka and the rare pale fork-marked lemur. The world’s smallest primate, the Madame Berthe’s mouse lemur, is also found in the forest. This weighs just 30 g.
Another natural area in Madagascar, Kirindy has abundant wildlife such as the giant jumping rat and the narrow-striped mongoose. The largest Malagasy carnivore, the fosa, is also found here and it is getting fairly easy to see.